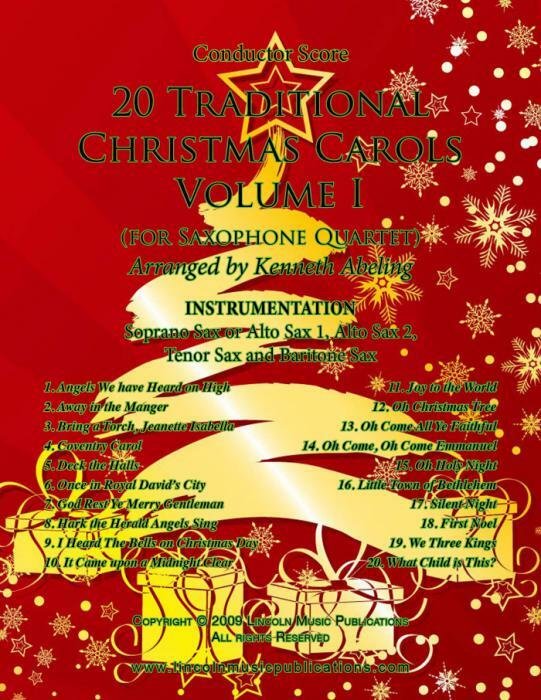 Traditional Christmas Carols for Saxophone Quartet Volume I contains 20 popular Christmas Carols from around the world, simply scored. Table of Contents: Angels We have Heard on High, Away in the manger, Bring a Torch, Jeanette Isabella, Coventry Carol, Deck the Halls, Once in Royal David's City, God Rest Ye Merry Gentleman, Hark the Herald Angels Sing, I Heard The Bells on Christmas Day, It Came upon a Midnight Clear, Joy to the World, Oh Christmas Tree, Oh Come All Ye Faithful, Oh Come, Oh Come Emmanuel, Oh Holy Night, Little Town of Bethlehem, Silent Night, First Noel, We Three Kings, What Child is This? Both Soprano and Alto Sax for Soprano parts are included for this arrangement.